Welcome! The lobby of the Deranged L.A. Crimes theater is open! Grab a bucket of popcorn, some Milk Duds and a Coke and find a seat. 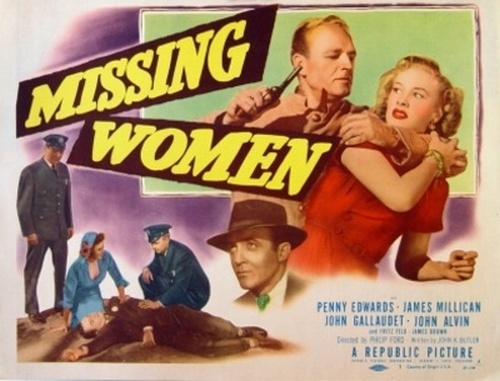 Tonight’s feature is MISSING WOMEN, starring Penny Edwards, James Millican, John Gallaudet and John Alvin. 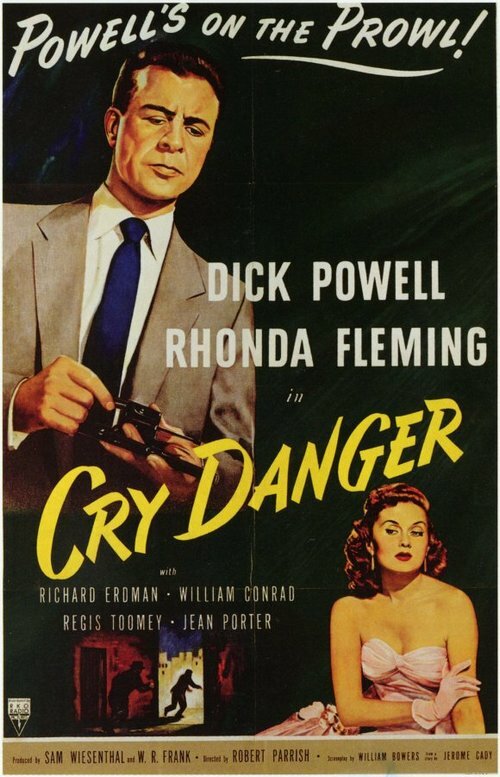 During their honeymoon, Claudia and Phillip Rankin are approached by two car thieves, Eddie Ennis and Hans Soderling, who kill Phillip. 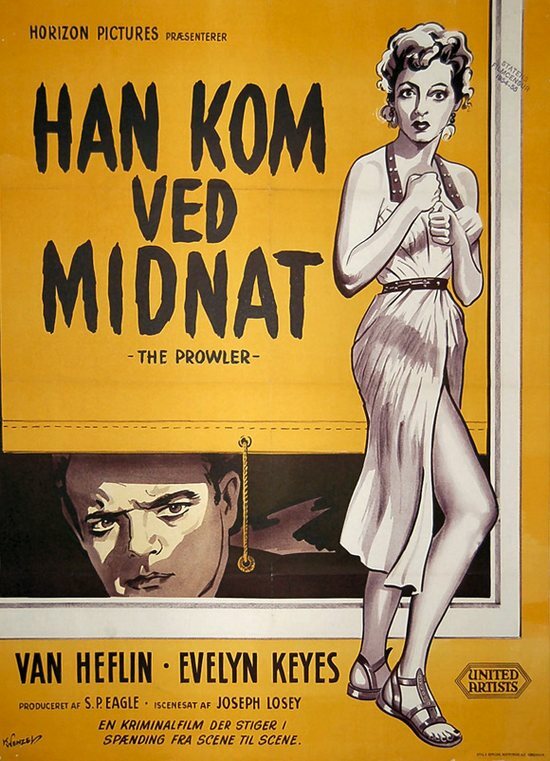 The lecherous Hans forces Claudia to drive off with him, and some time later, slugs her, then leaves her in the car by the side of the road, where she is found by a Good Samaritan, who contacts the police. Later, after homicide lieutenant Kelleher tells her that he believes that the perpetrators belong to a ring of car thieves he is investigating, she recalls hearing the names, “Eddie” and “Hands,” which Kelleher thinks might be a nickname. Kelleher shows Claudia the files of Frank and Mae Berringer, a brother-and-sister team now behind bars, and explains that hot car rings often include women, because they attract less attention. Desperate to help find her husband’s killers, Claudia gets an idea while looking at Mae’s file. Welcome! The lobby of the Deranged L.A. Crimes theater is open! Grab a bucket of popcorn, some Milk Duds and a Coke and find a seat. Last week we took a train to Alcatraz–tonight we head for Folsom Prison in the film INSIDE THE WALLS OF FOLSOM PRISON. The films stars Steve Cochran and David Brian. 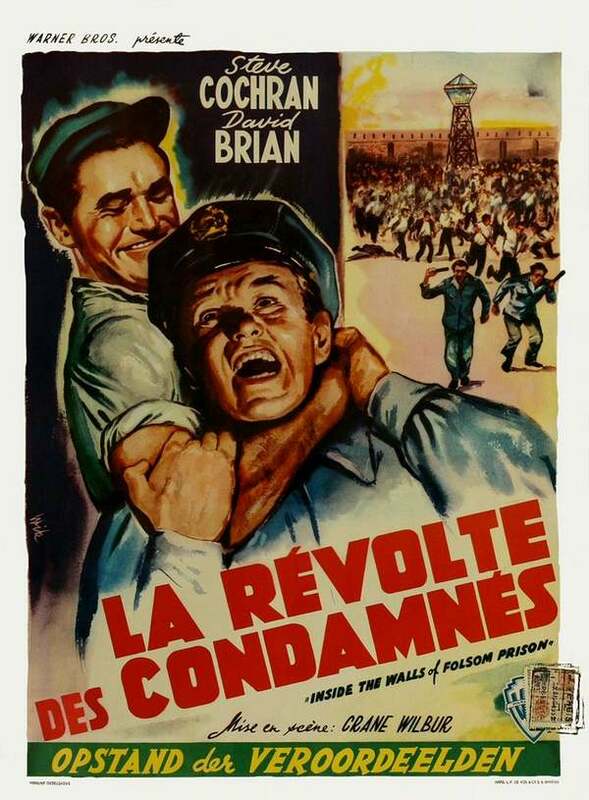 In the first half of the twentieth century, at California’s maximum security Folsom Prison, unhealthy conditions and brutal treatment are considered by the cruel, old-school prison warden, Rickey, to be the only way to handle the three-time convicted felons. One Sunday, against the advice of ringleader Chuck Daniels, several prisoners attempt a breakout. Although the riot is quickly suppressed by Rickey, two guards are killed along with several prisoners. Harsh punishments are meted out to those involved, and a Sacramento Press reporter, Jim Frazier, investigates a rumor that one of the instigators of the rebellion was beaten until paralyzed. Because of the prison’s recent problems and changing societal views regarding the treatment of inmates, the prison’s board of directors orders that new blood be infused in the system and sends penologist Mark Benson to serve as captain of the guards. Welcome! The lobby of the Deranged L.A. Crimes theater is open! Grab a bucket of popcorn, some Milk Duds and a Coke and find a seat. 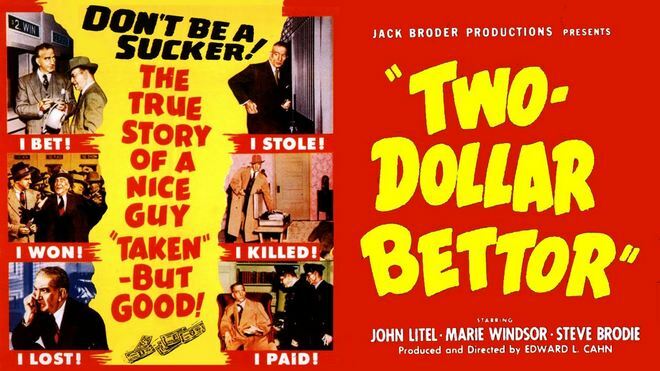 Tonight’s feature is TWO-DOLLAR BETTOR starring John Litel, Marie Windsor and Steve Brodie–also in the cast is Carl Switzer (Alfalfa in the Our Gang comedies). Betting on the ponies is obviously a slippery slope leading from the track to the morgue. Enjoy the movie! Despite his initial reluctance, family man and widower John Hewitt places a two-dollar bet at his first visit to the race track and wins. With brother-in-law George Irwin’s guidance and racing statistics, John continues betting and wins a down payment on new car for his daughters, seventeen-year-old Nancy and eighteen-year-old Diane. As comptroller of the Langston Bank, John earns a moderate living and has acquired some savings. Wanting to provide more for his daughters, John begins to place regular bets with bookie Krueger and arranges to meet Krueger’s associate, Mary Slate, each week to settle his account. Over the next few months, John’s obsession with the track grows as he successfully bets on jockey Osborne. When Osborne is injured; however, John’s winning streak ends and he soon loses most of his savings. One evening policemen Bud Crocker and Webb Garwood arrive at 1918 Orchid, Los Angeles, to follow up on the report of a prowler. The older, friendly Bud advises house owner and beautiful blonde Susan Gilvray to be careful but later that evening his partner, the younger flirtatious Webb, returns for a check-up call. While Susan and Webb listen to the radio and visit over coffee, Susan explains that she is alone because her wealthy, middle-aged husband John is the late night-disc jockey on the radio. Susan recognizes Webb as a once-famous high school basketball player from Indiana, where she grew up. Webb bitterly recounts his bad breaks since high school, but shares his dream of owning a motel court. Webb returns another evening to visit, and when he asks for a cigarette, Susan explains that her husband keeps both the cigarettes and her locked up. When Webb jimmies the desk drawer lock to retrieve a pack of cigarettes, he spies John’s will and surreptitiously reads it. Webb grills Susan about the marriage, and she reluctantly answers that though John provides for her, he has not provided what she really wanted, a baby. 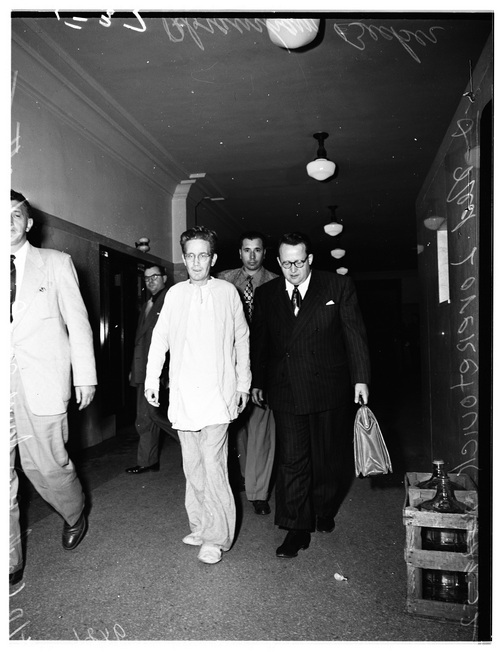 In 1939 Arthur Emil Hansen was sentenced to from two to twenty years in San Quentin for the courtroom slayings of two attorneys, R. D. McLaughlin and J. Irving Hancock, who were besting him in a civil suit that cost him every cent he had. Did Arthur learn anything from the crime or his punishment? Evidently not, because in January 1951 a plan he’d hatched from behind the gray walls of San Quentin to assassinate four Los Angeles judges and two attorneys was uncovered by the Sheriff’s Department. On Hansen’s list for liquidation were: Superior Judges Charles W. Fricke, Arthur Crumm and Frank G. Swain; Municipal Judge Lewis Drucker, former District Attorney Buron Fitts and Attorney Isaac Pacht. Apparently, Hansen had discussed his plan with a few of his fellow convicts — a big mistake–nobody will rat you out quicker. He had approached an inmate scheduled to be released on parole and offered to pay him $10,000 if he would murder one of the six men on his hit list. Hansen’s plan was diabolically elegant in its own way. He wanted the parolee to whack one of the people on the list, then he would “take care” of the remaining five when he was paroled. He told his confidant that he intended to leave one clear fingerprint at the scene of each murder. Then, when the five murders had been committed, the police would have all the fingerprints of one of his hands and his identity would be revealed. Sounds a little crackpot, doesn’t it. But in the 12 years that Hansen had been in prison he’d become quite paranoid. He had little else to do but sit and stew about the real or imagined wrongs he’d suffered in the L.A. courts. He refused to accept blame for his actions and his rage continued to build to a detonation point. Hansen gave his soon-to-be paroled friend a vitriolic letter, copies of which were to be given to various L.A. newspapers. The letter bitterly accused the judges, the Attorney General’s Office, the District Attorney and Governor Warren of conspiracy. Hansen’s letter also predicted that he would not be prosecuted for the murders because he would be revealed as an emancipator and a protector of the public. I wonder if he thought he had super powers. Hansen made a huge mistake when he directed that the letters be sent just as he was coming up for parole, He was just days away from being released when his plot was discovered. For the murder plot, Hansen forfeited all of his good time and at least six more years of his freedom. Two weeks after he was shot by Sheriff’s deputies James Monroe Rudolph, the Green Scarf Bandit, was on the mend in the prison ward of General Hospital. He was reported to be in a weakened condition, but evidently not too weak to confess to scores of robberies, burglaries, assaults and kidnappings. Deputy District Attorney Howard Hurd and a couple of Sheriff’s deputies, including one of my favorites from the era, Detective Sergeant Ned Lovretovich, were on hand to witness the statements made by Monroe. Monroe had been captured and critically wounded by deputies following a call from eight year old Jimmy Jones. Jimmy had telephoned the cops after bravely feigning sleep while Rudolph kidnapped his parents at gunpoint. It was Jimmy’s call that resulted in the capture of the the Green Scarf Bandit. For his courage Sheriff Eugene Biscailuz had awarded the boy a miniature Sheriff’s badge. The authorities were keen to get Rudolph in front of a judge, but his physical condition delayed the proceedings. Another complication was that there was so much stolen loot in the Ruldoph home in Placerville that it was going to take some time for it to be sorted out and put on trucks so that it could be placed into evidence. Cops estimated the worth of the stolen goods to be in excess of $60,000 [$537,851.00 in current U.S. dollars]. 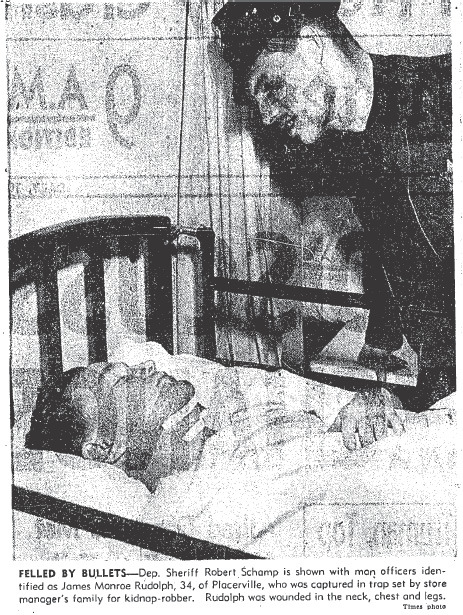 Finally on January 30th James Monroe Rudolph, clad in his prison ward jammies, was sufficiently healed from his multiple gunshot wounds to appear for arraignment before Municipal Judge F. Ray Rennett. In the complaint, sworn to by Deputy Sheriff Dave Terry and issued by the Deputy D.A., Rudolph found himself charged with five counts of robbery, four of attempted robbery, nine of kidnapping and two of false imprisonment. Four of the robberies involved food markets from which Rudolph had made off with thousands of dollars in cash. One of the robberies had been particularly bold. Just a few days prior to the kidnapping of B.G. Jones and his wife, the Green Scarf Bandit had used the same M.O. to rob a La Crescenta supermarket manager and his wife twice in one day! Alfred W. Boegler and his wife Irene were awakened at about midnight when a man in a green scarf mask climbed through their bedroom window. Holding a pistol on the couple, the bandit politely turned his head as Irene changed from her nightgown into street clothes so that she could accompany her husband and the crook to the Shopping Bag Market at 3100 Foothill Blvd in La Crescenta. Hey, he may have been a gun wielding robber but he wasn’t necessarily indifferent to the comfort and safety of young children. As the couple’s two daughters, Barbara (4) and Karen (18 months) slept soundly, Boegler drove his wife and the robber to the market. Once they arrived at the store the gunman used Irene as a hostage while Alfred went into the store with a passkey and turned off the burglar alarm. All the while the gunman apologized saying that his boss was “pretty tough” and he’d face dire consequences if the job didn’t go off perfectly. After looting two safes at the market the bandit let the Boegler’s out of their car at the corner of Altura Street and Pennsylvania Avenue. They phoned the Montrose Sheriff’s station (the same station young Jimmy Jones would call a few days later) and walked the short distance to their home. They collected their two kids and then went to the home of Boegler’s brother, William. When the Boegler’s returned to their own home a mere six hours after being taken from their warm bed they were met by the green scarfed gunman who was waiting patiently for them in the kitchen. The man then kidnapped the Boeglers for a second time, emptied out a third safe, and fled. Rudolph may have thought of himself only as a bandit, but two of the kidnapping charges involved bodily harm, which in California, because of the Little Lindbergh Law could be sufficient to send him to the gas chamber. Following the kidnapping and murder of Charles Lindbergh, Jr. on March 1, 1932, Congress adopted the Federal Kidnapping Act (aka Lindbergh Law), a law which allowed the feds step in once kidnappers had crossed state lines with their victim. There were were several states, California among them, that implemented their own versions of the law which applied in cases of kidnapping when victims were not transported across state lines; hence Little Lindbergh. California’s Little Lindbergh statute made kidnapping with bodily harm a crime eligible for the death penalty. In 1951 when the Green Scarf Bandit was busted the Red Light Bandit (Caryl Chessman) was already on California’s death row for kidnapping — he had been convicted under the Little Lindbergh law. Knowing that another bandit was sitting on death row may have provided the motivation for Rudolph to plead guilty to three felony charges: armed robbery, kidnapping for purpose of robbery and false imprisonment. With his plea Rudolph was able to evade the death penalty. For his misdeeds James Monroe Rudolph was sentenced to a term of from five years to life. The Green Scarf Bandit had no intention of serving out his sentence. About seven months after arriving at Folsom Prison Rudolph and his cell mate, Claude Newton, attempted to break out. The men had cut holes in the iron cell doors and were waiting for the right moment to bolt when they were discovered by guards. They had stuffed overalls with paper and placed the decoys in their bunks. Newton had even braided a rope out of bed sheets and put a hook on the end so that they could scale the wall. But eight year old Jimmy Jones wasn’t asleep, he was playing possum. He feigned sleep even as the masked man entered his bedroom with a flashlight and looked around. Not many kids would have had remained as cool and collected as Jimmy, but the boy had an advantage, he had been prepared for the possibility of a break-in by his father. B.G. had recently warned Jimmy him that there was a bad guy in the area who was kidnapping supermarket managers and forcing them to open the safes at their stores. B.G. had told Jimmy if he heard anyone break into the house that he was to lie still, wait until it was safe, then run to the phone and call the Sheriff’s Montrose substation; and that’s exactly what Jimmy did. The radio car in which Deptuies Joe Rieth and J.R. Shelton were riding was immediately dispatched to the Shopping Bag Market at 920 Foothill Blvd in La Canada. The deputies roared up just as Jones, stalling for time, was fumbling with his key before unlocking the door for the bandit. The masked man ran from the cops smack into John Davis, an off-duty deputy. Davis pulled his pistol and commanded the man to halt, but the fugitive continued running even as Rieth and Shelton fired at him. Slugs from Reith’s weapon penetrated the man’s neck, while pellets from Shelton’s shotgun peppered his legs. The man was so pumped with adrenaline that he continued to flee. 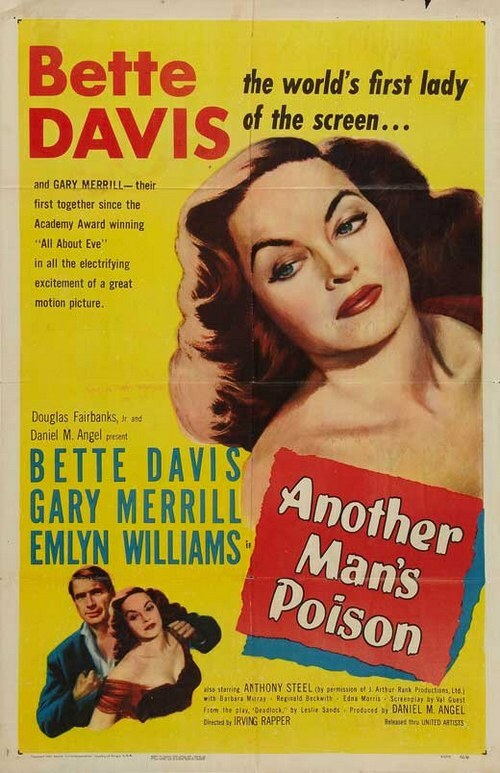 When Rieth and Shelton caught up with the masked man they found him slumped over the wheel of Davis’ car desperately attempting to fire up the engine. The critically wounded crook was taken to Physicians & Surgeons hospital, Glendale, where he gave his name as Jim Marcus. The Sheriff’s didn’t take the man at his word which was just as well, he was lying. It didn’t take long for them to ID him as James Monroe Rudolph of Placerville, California, which is located about 450 miles from where he’d committed his most recent crimes. Deputies found Rudolph’s late model Buick sedan parked about a block from the Jones’ home and when they searched the trunk they found some highly incriminating evidence: 100 empty money sacks (the kind used by businessmen to make bank deposits); scores of rolls of coins; and a wallet containing five $100 bills and an ID that gave Rudolph’s L.A. address as a motel at 4562 N. Figueroa Street. Also in the car were several changes of clothing, a .45 caliber automatic pistol, a Las Vegas police badge and a fire extinguisher loaded with a knockout solution for spraying victims, and a green scarf. The cops finally had the Green Scarf Bandit, the villain who had been eluding them for weeks. Sheriff’s robbery squad detectives went to Placerville where they arrested Rudolph’s wife, Inge, a German war bride. Inge surrendered to the detectives two fur coats, a fur jacket, a fur neck piece, several pairs of expensive field glasses, a half dozen cameras and several thousand dollars worth of jewelry. Inge insisted that she wasn’t a party to her husband’s misdeeds, and the police believed her. She told the cops that she thought that he had purchased the luxury items with money he had won in card games. Inge must have thought her husband was a high roller when he put over $8,000 [equivalent to $71,713.00 in current U.S. dollars) down on their $17,000 [equivalent to $152,291.00 in current U.S. dollars] home. 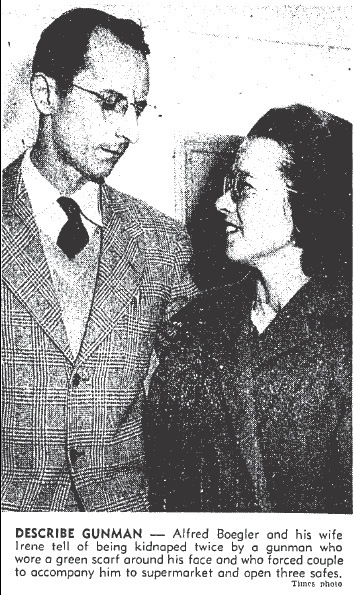 Rudolph and Inge had met in Germany and they married in a civil ceremony in Linz, Austria in 1947. After Rudolph’s discharge from the Army in 1949 Inge accompanied him to the U.S., first to his hometown of Atlanta, GA, then to Washington, D.C., and finally to California. While the cops were searching the Rudolph home for more of the Green Scarf Bandit’s stolen loot, Inge traveled from Placerville to Los Angeles to visit James. When she saw his condition she wept at his bedside and then declared that she would stand by him. Would James Monroe Rudolph, the man that Jimmy had helped to capture, recover from his gunshot wounds or would he die before he could be tried? NEXT TIME: The fate of the Green Scarf Bandit.